The conference will be held in Best Western Hotel International Brno which is a luxurious hotel situated on the city wall circle avenue near the Špilberk castle. The building was built in 1962 and its style is based on the pre-war Bauhaus architecture with additional Brussels style features, modern soffit constructions and sophisticated lighting features in the interior. We recommend the hotel as one of the options of your accommodation. Congress Centre of the hotel is located on the ground floor of the building. 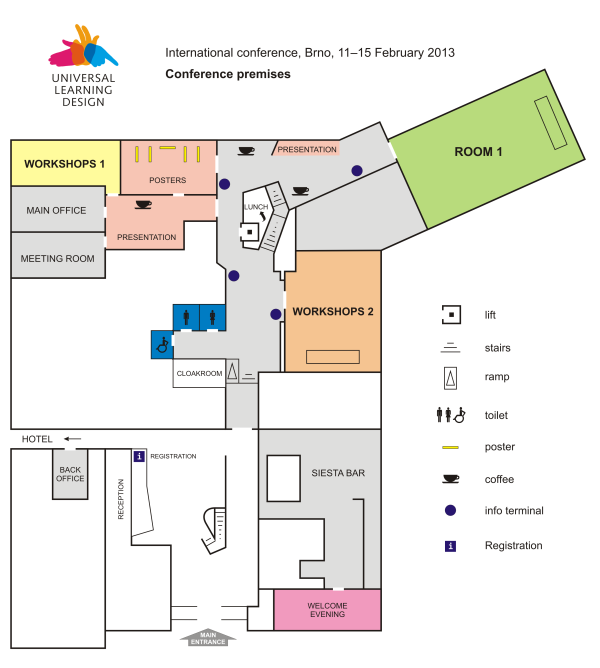 It consists of two large halls and seven smaller meeting rooms which will be used for purpose of the conference as the plan below shows. The current centre of the South Moravian region is no longer typical for its Czech-German ties as was the case in the times when there were fewer Czechs than in Vienna, who were nonetheless asking for a foundation of a Czech university; however, it is the centre of a variety of international activities thanks to its convenient location among Vienna, Bratislava and Prague. The very Czech university, which Brno had desired for for so long, and the founding document of which was eventually signed by the first Czechoslovak president Tomáš Garrigue Masaryk in 1919, is going to become the host of the ULD conference. Besides the Masaryk University, Brno is now the seat of other 5 state and 9 private universities and colleges which means an extraordinary concentration of educational institutions and an oustanding experience in the field. Best Western Premier Hotel International Brno is a luxurious hotel situated on the city wall circle avenue near the Špilberk castle. The building was built in 1962 and its style is based on the pre-war Bauhaus architecture with additional Brussels style features, modern soffit constructions and sophisticated lighting features in the interior. Rooms are air-conditioned, equipped with bathroom, toilet, direct-dial telephone, LAN internet connection, satellite TV and minibar. Buffet breakfasts, the use of wireless internet connection Wi-Fi as well as the use of swimming pool, whirlpools and saunas in the hotel fitness center are included in the price. The reservation of the contracted hotels can be made together with the registration for the conference. Special price conditions apply only when booking via the conference form. Your booking will be forwarded to the hotel which will send the confirmation within 24 hours at the latest. Please contact us should you not receive any confirmation.